Bethune-Cookman University president Edison Jackson, right, appeals to protesters disrupting Education Secretary Betsy DeVos' speech during commencement exercises, Wednesday, May 10, 2017, in Daytona Beach, Florida. 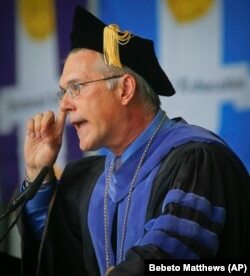 When Grant Cornwell became the 15th president of Rollins College in Winter Park, Florida, in 2015, he understood the challenges he would face. He had already served as president of the College of Wooster in Ohio for eight years. College and university presidents in the United States have many different responsibilities in addition to the daily operations of their school, Cornwell notes. These include identifying the strengths and weaknesses in school operations, and creating a plan to improve them. Another duty is communicating the needs and concerns of students, parents, professors, administrators and governing boards among the different groups. In addition to these responsibilities, there are special issues that current presidents must deal with, says Cornwell. He notes American college students are more diverse than they ever have been, racially, economically, and in other ways. Schools welcome this diversity, but it also means there are far more needs that must be met, such as mental health and educational support. Cornwell argues that every generation of president feels the issues they face are the most difficult. They choose to work in the field, he says, because they believe a strong education system is necessary for a healthy democracy. But it is not an easy job. However, a new study suggests fewer U.S. college and university presidents are staying in their positions for a long as Cornwell suggests. Experts argue this is because the job is, in fact, more challenging than it ever has been. Dr. Vincent Boudreau, interim president for City College of New York (CCNY), speaks to graduates during a graduation ceremony for the division of Humanities and the Arts, Wednesday May 31, 2017, in New York. Every few years, the American Council on Education publishes a study on college and university presidents. In the most recent publication, researchers spoke with presidents at over 1,500 public and private, two and four-year institutions about their positions. The study showed that in 2016, the average amount of time presidents had been in their current positions was 6.5 years. In the 2011 publication of the study, the average amount of time presidents had been in their current positions was 7 years. In 2006, the average was 8.5 years. Jonathan Burke is the associate director of the Center for Policy Research and Strategy at the American Council of Education. He notes that the researchers only spoke with current presidents. To get a better idea of presidential service lengths they would have to speak with former presidents too. But Burke says, in general, the last three studies do suggest a decrease in the length of time presidents are serving. Why might this be happening? He blames, in part, changes to the level of state support for higher education. Burke says that following the economic recession the U.S. faced in 2008, most states greatly reduced their financial support for colleges and universities. Many are only now starting to return to the levels of financial support they offered before the recession. Yet there have never been as many students entering American higher education as there are now. This means many presidents are expected to do more with less, he says. “The amount of pressure that I think is placed on these individuals to be able to perform at such a high level … can lead presidents to leave their positions maybe sooner than, maybe, what we would see 20, 30, 40 years ago,” Burke added. President of the University of Southern California C.L. 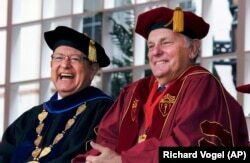 Max Nikias, left, laughs with head of USC Board of Trsstees John Mork, during USC's 134th graduation ceremony in Los Angeles on Friday, May 12, 2017. Yet it is not just an issue of financial limitations, says Lynn Pasquerella, president of the Association of American Colleges and Universities. After all, state support is mainly for public institutions, she notes. The overall cost of higher education has increased greatly in recent years, Pasquerella notes. That is in part due to reductions in state support, but also because of increased government regulations. Schools must employ more administrators to make sure they are following these many new rules, she says. And the needs of a more diverse student body means greater spending on support services. These increased costs have intensified the debate over the overall cost of receiving a college education, she says. Parents want to know that the money they spend will get their children good jobs afterwards. At the same time, governing boards more often want presidents to run schools like businesses, rather than as a public good. They want to have greater control and faster results from improvement plans, reducing the level of shared governance with students and professors. And, Pasquerella says, this generation of students are more politically divided than those in the past. Student demonstrations have become common, as have intense exchanges over social media. And disputes over issues like racial inequality, sexual violence and free speech lead to debates that quickly get out of a president’s control. “If you have someone knocking on your door, saying, ‘We’ve just read this in the newspaper. What’re you going to do about it?’ it doesn’t give you an opportunity to respond in any thoughtful way,” said Pasquerella. She and Grant Cornwell agree that presidents leaving their positions sooner can greatly harm the long term goals of an institution. Avoiding this means schools should be paying presidents more than they have in the past to match the increased risk. But a study published in the winter 2019 Review of Higher Education argues that increasing presidential pay may not be that helpful to the school itself. The study looked at presidential pay at 119 public institutions. It showed there is no relationship between higher pay and increases in outside donations or state aid, two things for which presidents are often considered responsible. Pete Musto reported this story for VOA Learning English. Caty Weaver was the editor. We want to hear from you. How can colleges and universities keep their presidents for longer? Write to us in the Comments Section or on our Facebook page.